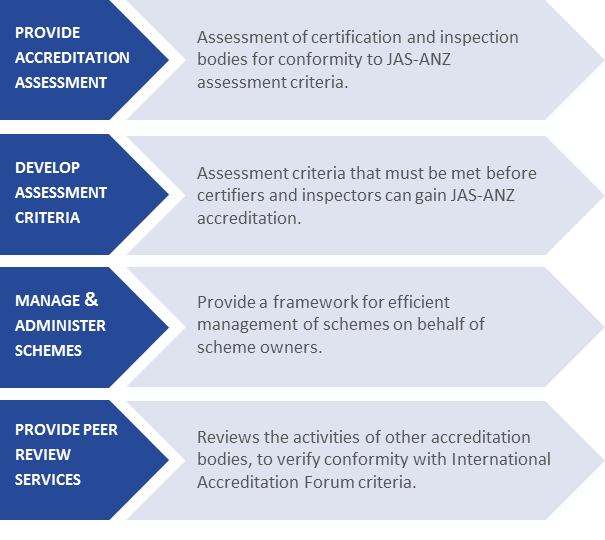 The Joint Accreditation System of Australia and New Zealand (JAS-ANZ) helps markets work better by providing internationally recognised accreditation services that create economic benefit. providing assurance that goods and services sold are safe and can be used for their intended purpose. These strengthen national, Trans-Tasman and international trade and commerce. 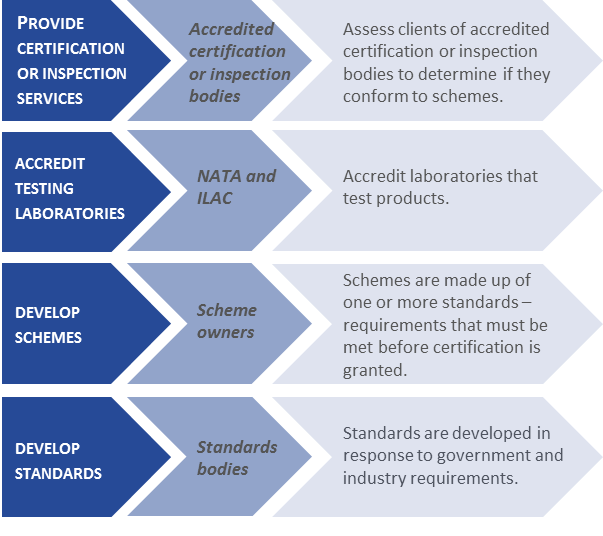 Accreditation adds value to the ever growing and increasingly complicated market chain in many ways, including by providing a symbol of assurance that certifiers and inspectors are independent and competent to perform their duties. Accredited certification and inspection of products, processes and people—called conformity assessment—has a ripple effect through the market chain, right to the consumer. It gives consumers confidence that their purchases meet specified standards and are quality assured. This includes retailers, wholesalers and individual consumers. Accreditation is a symbol of assurance—a valuable asset in itself. The JAS-ANZ symbol is a mark of quality and reliability. It flags that a certifier or inspector can be counted on to impartially determine if organisations, products and people conform to specified requirements. This gives certifiers, inspectors and their client organisations a competitive edge. Figure1 Who benefits from our work? JAS-ANZ is here to help. We don’t do everything in the conformity assessment field.